Do you ever have those weekends where you go, go, go and you finally come to a point where you have to take a nap or collapse before you try to do anything else without hurting yourself, getting overly irritated, or crying over spilt milk? Yep, that was me this weekend. I knew it was going to be one of those weekends when on Friday night I stated how I couldn’t wait to “sleep in” next weekend…hello, what happened to this weekend?! 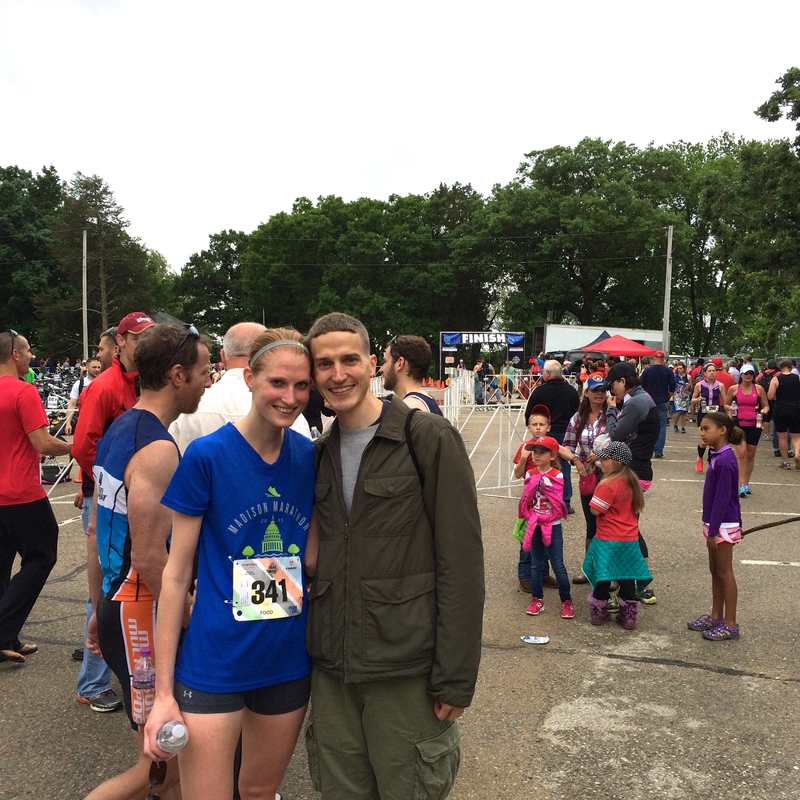 Well, work on Saturday plus a very early triathlon on Sunday morning happened this weekend. Mixed in there were house and garden “chores”, a picnic with friends, and another get together with more friends. Yes, the busy summer schedule is upon us. Which means summer food is also upon us. 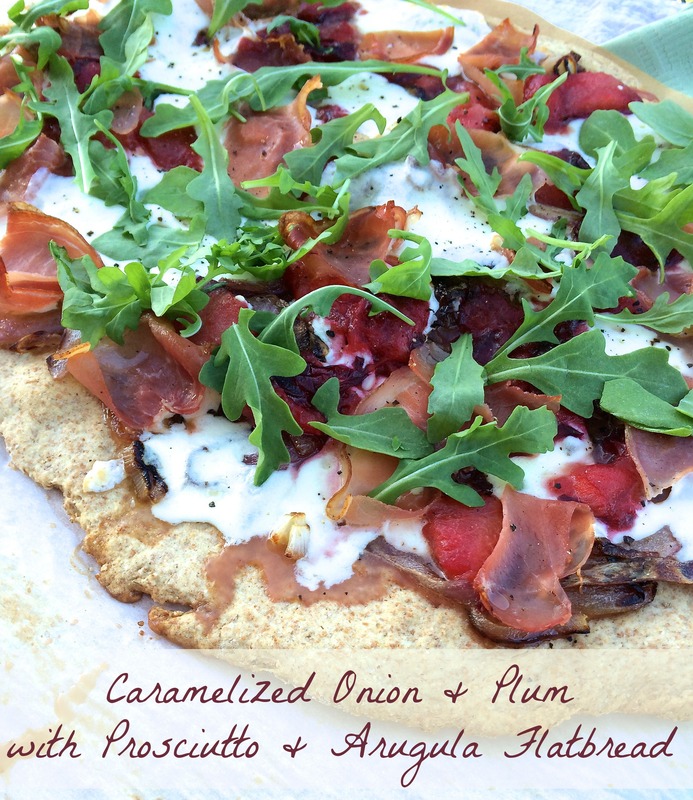 And my Caramelized Onion & Plum with Prosciutto & Arugula Flatbread is a great and fresh meal to get us started with warm days and cool evenings that go far past my bedtime. Tell me you don’t get excited by the color on that pizza. No? Just me? For me, when the food looks beautiful, the flavor gets amped up just a little bit, too. 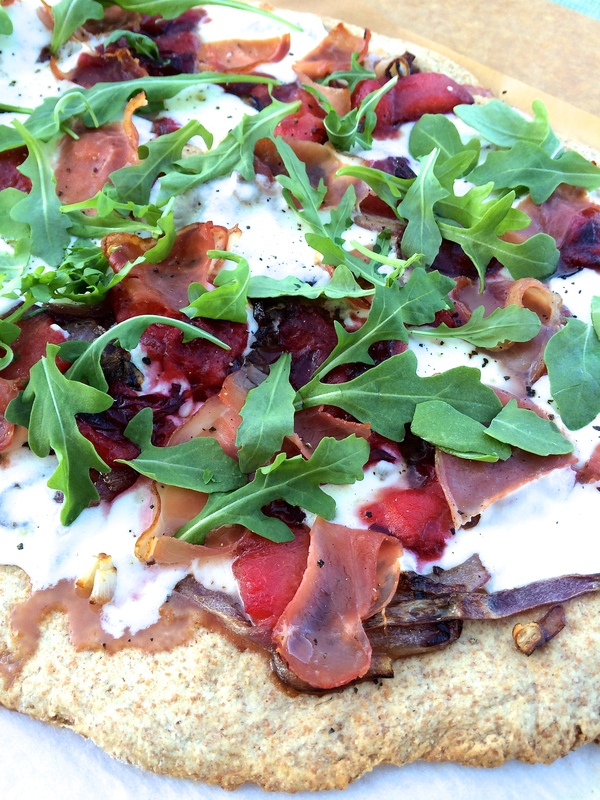 Although we don’t think about it, we really do eat with all five of our senses — this flatbread successfully executed on that. The appearance is vibrant, but the flavor is everything from juicy and sweet to savory and satisfying. While the ingredients are simple, they all come together into one tasty, complex bite. I know, I’m going out on the limb with this recipe. 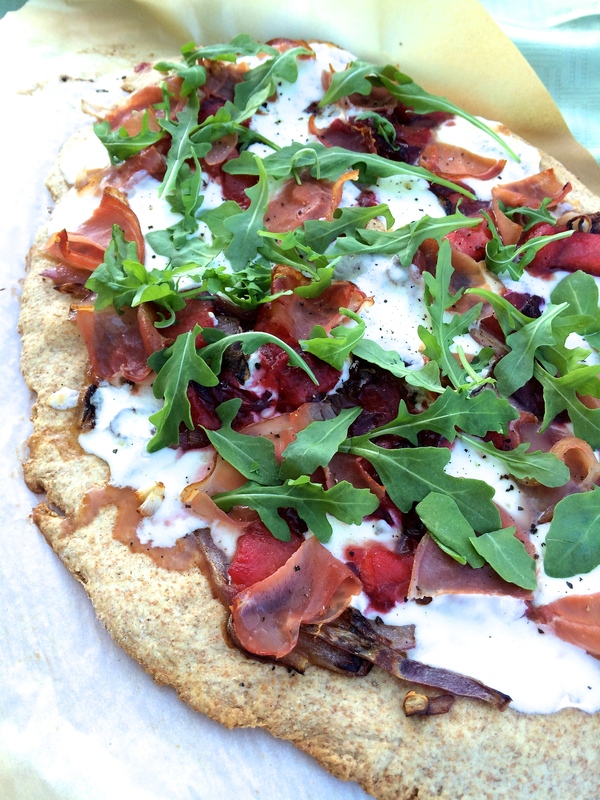 This flatbread is certainly not like your typical, tomato-based pizza and while it may be slightly out of your norm, it’s summer, which means everything flies, right? Your taste buds will be pleasantly surprised by this one. 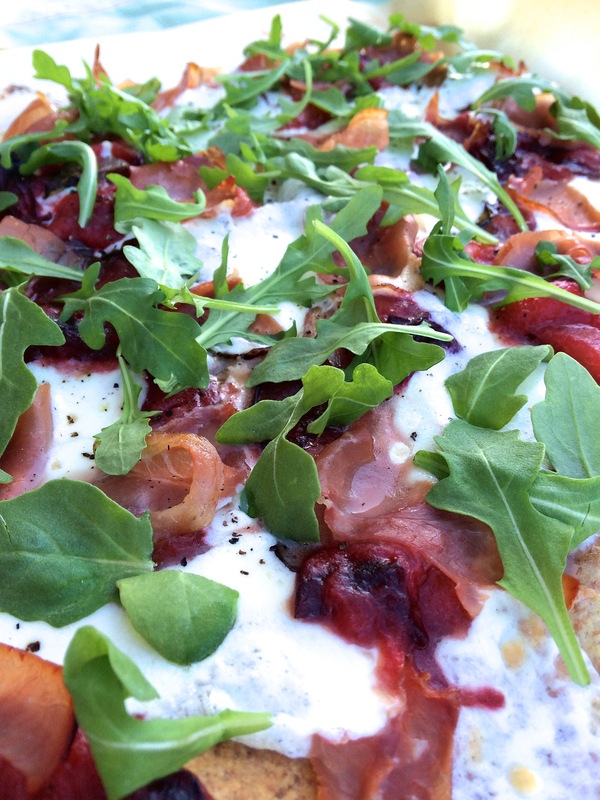 With stone fruits coming into season, this is the perfect time to change up your normal pizza night. 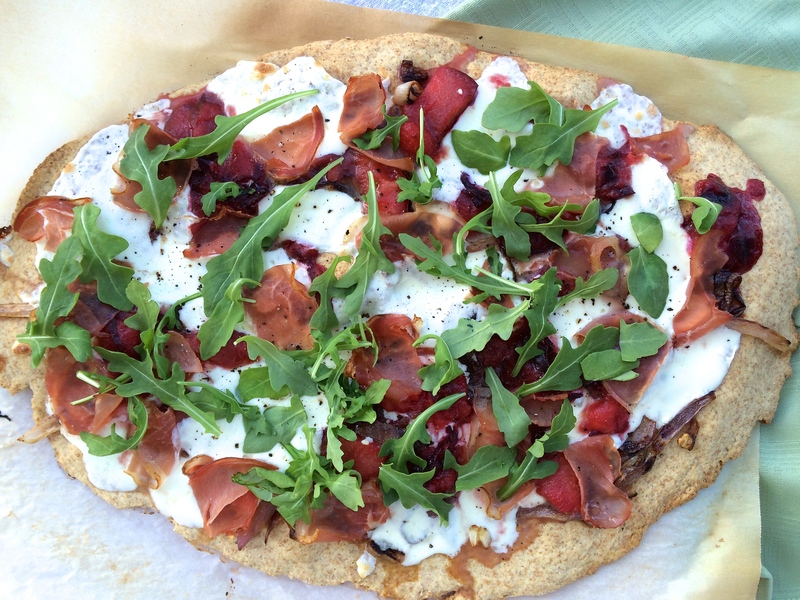 Pick up some juicy, ripe plums and try out this perfect-for-summer pizza. Sleep deprived or not, you’re going to love it. Preheat oven to 450°F. In a large skillet on medium, heat 1 tablespoon of oil. Add onion and cook, stirring occasionally, until onions are very soft and lightly browned, about 20 minutes. Transfer to a small bowl and set aside. In the same skillet on medium-high, working in two batches, heat half of butter. Add half of plums in a single layer and cook without stirring, until soft and golden brown, about 2 minutes per side. Transfer to a medium bowl and repeat with remaining half of butter and half of plums; set aside. In a large bowl, whisk together flour, baking powder and salt. Add water and remaining 2 tablespoons oil and stir until just moistened. Sprinkle flour on a work surface. Transfer dough to surface and knead into a ball. Press dough into a thick disk, sprinkle with flour. Place dough on a sheet of parchment paper and roll it out into a large oval, approximately 1/8 inch thick. Slide dough (with parchment paper) either onto a large baking sheet or transfer to baking stone (put baking stone in oven while oven is preheating). Bake in center of oven until dough is set and just beginning to brown, about 10 minutes. Remove baking sheet from oven and top with caramelized onions, plums, prosciutto, and cheese. Sprinkle freshly ground pepper on top. Return to oven and bake until dough is light golden brown and cheese is melted, 5 to 7 minutes. Remove from oven and top with arugula. This pizza looks incredible, Kara!